one of the most influential composers in postwar Japan, will be finally published! ★We accept orders from abroad (click “add to cart” above) and shipping via EMS on this page. ★The price includes EMS shiping fee 4,000 yen regardless of country. Payment system usage fee is 1,000 yen (total amount: 17000 yen). From the perspective of Electroic Music = Technology, Koji Kawasaki, a leading authority on electronic music in Japan, researched all works of Toru Takemitsu and his whole life more precisely than ever before, based on a vast amount of primary sources and acoustic analyses using the latest technology. This book widely reveals not only individual activity of Toru Takemitsu but also postwar electronic and modern music world, the landscape and interaction of various art fields including broadcasting media such as TV and radio, movies, avant-garde art, modern poetry and theatrical performances, and further also the process of spread of electronic music in Japan. Moreover, the research found more than 50 previously unknown works of Toru Takemitsu and newly discovered remarks of the composer. This book with an index of more than 1000 entries is a must as an encyclopedia of Toru Takemitsu! If you purchase the book by August 31, 2018, you will get an invaluable CD of Static Relief (1955), Takemitsu’s earliest tape music, which was newly digitized and restored by Yasushi Utsunomiya. * In 1948, just 70 years ago, Pierre Schaeffer created the world’s first work of musique concrète. Takemitsu said that he also conceived the idea of musique concrète in the same year. Therefore the year 2018 marks the 70th anniversary of Japanese electronic music. * This book introduces about 50 works of Toru Takemitsu, which are not in the list of the Complete Works of Toru Takemistu. Some of them were discovered and analyzed by Koji Kawasaki, the author of this book. Moreover he discovered a lot of text by Takemitsu and his interview articles, which are not included in previously published books. * Through the research for this book, it was found that Takemitu wrote music for 120 films. Among them, the author obtained 93 films and analyzed all music for them. Especially electronic musical works for Crazed Fruit (directed by Kō Nakahira), Gin-Rin (directed by Toshio Matsumoto, musique concrète), The Woman in the Dunes (directed by Hiroshi Teshigahara), Kwaidan (directed by Masaki Kobayashi, tape music), Ran (directed by Akira Kurosawa) were analyzed in detail, and the relationship between Takemitsu’s creative activity and electronic music was considered. * Takemitsu was one of the founding members of Jikken-kobo, an artist group of multimedia and intermedia. Poet Shuzo Takiguchi assisted the group and artists and photographers such as Katsuhiro Yamaguchi, Shozo Kitadai and Kiyoji Otsuji, and composers including Joji Yuasa were members of the group. The book also deals with such avant-garde art scene in detail. * Young Toru Takemitsu, Hikaru Hayashi, Michio Mamiya wrote music for Shiki Theatre Company when it was just established. Contrary to today’s image of spectacular musical company, Shiki used to provide performances with early musique concrete in Japan. The book reveals the activities of Shiki as an edgy drama company at that time. * Toru Takemitsu produced music for NHK’s early TV programs for children. So far there had been few remaining documents that show the relationship between early broadcasting media and avant-garde music, but the research this time has discovered that there were many works for programs written by Takemitsu. * Four months before the broadcast of the first work of electronic music in Japan by Toshiro Mayuzumi in November 1955, Takemitsu had already begun to produce a work with electronic sounds for a radio program. The book reveals his pioneering creativity that had not been previously known. * In the early radio broadcasting in Japan, stereophonic broadcasting was attempted and NHK started the first regular stereophonic programs in the world. Takemitsu created works of musique concrète for the stereophonic broadcasting at once and made a big contribution to the development of media. * In the 1950’s, a number of radio stations as new media were established throughout Japan. Although the technique to produce programs had not been built yet, Takemitsu could make a lot of artistic radio programs using new technology of recording reproduction. The book introduces the process of establishment of each radio station and of improvement of their studios. Reading this book, you can learn the history of broadcasting media in Japan. * Musique concrète, electronic music in Japan, had developed through the National Art Festival, which is ongoing today and where Japanese broadcast stations competed with each other for their artistic quality and technical capability. This book discusses the process of how musical works using electronic technology has been developed through the festival. * Takemitsu served as a producer of festivals such as Orchestral Space and Music Today, and of Steel Pavilion of the Japan World Exposition ’70. The book considers Takemitsu’s conception for the future through the various media events which symbolized the postwar Japan. * Takemitsu also made music for TV dramas and documentaries. In this book, there are analyses of Takemitsu’s sound experiments for programs including an experimental TV drama produced by Ben Wada, documentaries by Naoya Yoshida who cast a new light on the world history, and popular drama such as Yumechiyo Nikki [Diary of Yumechiyo]. * Takemitsu collaborated with various poets such as Shuntaro Tanikawa, Makoto Ooka and Shuji Terayama many times. 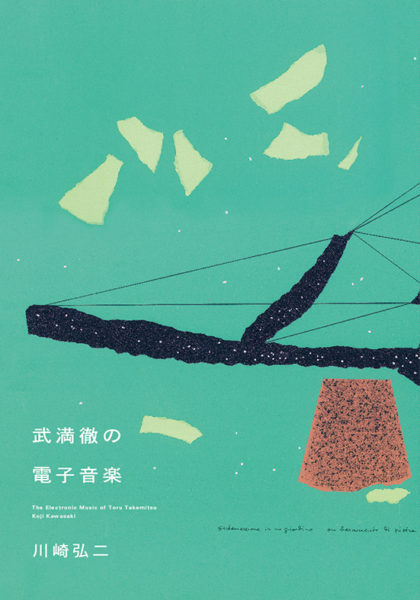 Therefore, tracing Takemitsu’s creative activities means tracing the history of Japanese modern poetry. * Takemitsu also collaborated with contemporary literary figures such as Kobo Abe, Shintaro Ishihara, Jun Eto, Kenzaburo Ooe and Hiroshi Sakagami. In addition, with writers, Takemitsu participated in the movement against the revision of the Police Duties Execution Law in the late ’50, the conflict over the Japan-US Security Treaty, ant-Vietnam War campaign, and antinuclear movement. The book also considers the massage that Takemitsu left to the society from the standpoint of a musician. Born in Osaka, Japan in 1970.